A View From The Kitchen: Waiter, my soup is cold! Waiter, my soup is cold! In the mist of the most humid, hot and sticky mid-summer in recent memory I’ve decided to undertake the daunting task of making a heaping handful of chilled soups. Not the few I’ve done before, and nothing that obviously won’t sell. It is ‘daunting’ in that chilled soups don’t seem to go over very well. Not just now, but in the past I’ve seen beautiful product go into a soup that is absolutely mind blowing delish, and it sits in the cooler with a stack of cold plates next to it rotting away. Not this summer, and not on my watch. I’ve already started this week. 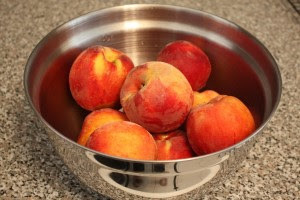 So here is the recipe scaled down for home use…..
Start by peeling the pesky little sticker off the peaches and then remove the pit. Everything goes in a blender for a few minutes. If there isn’t a dusty bottle of peach schnapps under you sink look for one or two of the tiny ‘airline’ bottles at your local liquor store. Be sure to serve ice cold.